One Hot Lap: OneHotLap Contest: What's Wrong with This Picture? OneHotLap Contest: What's Wrong with This Picture? There are at least three things that don't look right with this picture. First one to point out all 3 of them here or on our Facebook page wins a OneHotLap t-shirt! A few people, including the owner of the car Omeed A. of "Iron Man" fame, got 2 answers right. After careful consideration... nah screw that -- since we had some pretty good laughs at his own expense with this contest, we will break the tie in his favor. Omeed takes the OneHotLap t-shirt. Thank you everyone for playing! What a fun, creative bunch -- that thing HAS to be offline wherever it is, LMAO!! Number peeling, looks like the hood is going to pop open and the front wheel is too close to the lower back part of the wheel well/rocker panel. Cutoff for submitting entries is 11 am, Jan 31. Winner will be announced at noon! 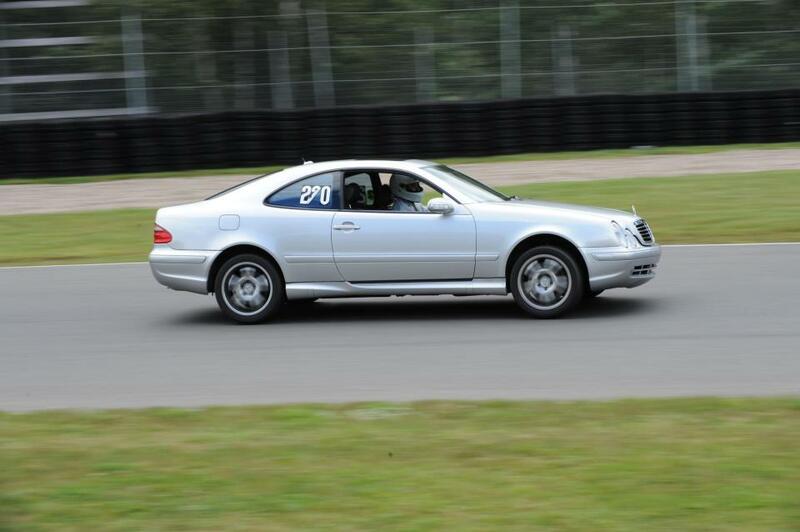 Henry H: 1. the sticker is coming off... 2. it's a mercedes... 3... it's on a track.. @_o ?! Jamey: window is down, sticker falling off and no front license plate, or maybe headlights aren't taped? Jessie L: That's tough. Sticker falling off, not on racing line, hood popped open a little? Eric H.: R-comp tires on a Mercedes in RGrp2, Solo driver in RG2, no neck brace/hans/proper harnesses, no window net or right side interior net, does not appear to have seat belt on... should I go on? Eric H. Oh wait a minute, this is an HPDE! 1) Automatic Mercedes on track is FAIL 2) car is not plastered with Blue painters tape 3) that thing HAS to be offline wherever it is. 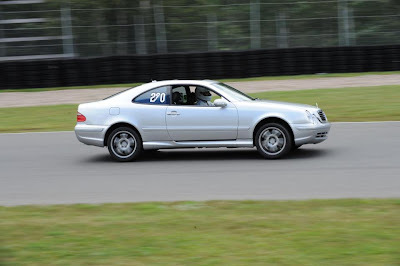 Gary R: Looks like it is turn ten Circuit Mont-Tremblant. . . . .Left my 3 OneHotLap site. Me and Jessie agree on two. OneHotLap: That's a good one, Gary! You and Jessie agree, so it must be right? Safety in numbers! Are you splitting up the t-shirt prize if your entry wins? Jessica S.: That's actually a pretty sweet photo with the background blurred and the photo of the car is very sharp. Regardless, It's a great souvenir shot for whoever is driving it! A few people, including the owner of the car Omeed A., got 2 answers right. After careful consideration... nah screw that -- since we had some pretty good laughs at his own expense with this contest, we will break the tie in his favor. Omeed takes the OneHotLap t-shirt.